In a paper entitled "Gravitational lens system SDSS J1339+1310: microlensing factory and time delay" currently in preprint at arXiv , authors Luis Julian Goicoechea Santamaria and Vyacheslav Shalyapin reveal how the Liverpool Telescope (LT) has been used to characterise a gravitational lens created by a foreground galaxy in direct line with a much more distant quasar. Light from quasar is bent by intervening galaxy's gravity, causing double image (A & B) at Earth. Quasar image inset is real LT data. © 2016 J. Marchant / LT group. Light from the quasar that is heading in the general direction of Earth is passing either side of the foreground galaxy, and is being bent by the galaxy's gravity to meet at a focus at the Solar System. From Earth we therefore see two images of the quasar, but because each light path takes a slightly different route around the galaxy, one longer than the other, the images are out of sync. Therefore any disturbance or variation in brightness from the quasar will be seen first in one image, and then repeated after some delay in the other image. The LT data has not only revealed the time delay between both images, and also that the lensing galaxy is causing microlensing with its constituent stars along the light paths from the quasar. Since 2005, the Gravitational LENses and DArk MAtter (GLENDAMA) team has been conducting optical monitoring of about 10 gravitationally lensed quasars with the LT. For each target, the main goals are to measure time delays between the multiple quasar images, as well as analyse the intrinsic variability of the lensed source and the possible flux variations caused by microlenses (stars) in the lensing galaxy. After an 8-year monitoring campaign of the double quasar SDSS J1339+1310 in SDSS-R band, the LT light curves of its two images, A and B, are characterised by typical photometric accuracies of 1-2% and an average sampling rate of once every 6 days (excluding gaps). Lightcurve of quasar images A & B from 2009-2016 (dates along top axis). From paper by Goicoechea and Shalyapin (2016). These light curves show parallel V-shaped variations, which allowed the GLENDAMA team to determine a time delay of 47 days with 10% precision. 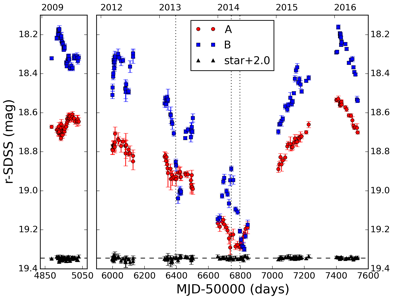 In addition, the accurate follow-up observations of both images reveal the presence of significant microlensing-induced flux variations on different timescales, including rapid microlensing events lasting 50-100 days. 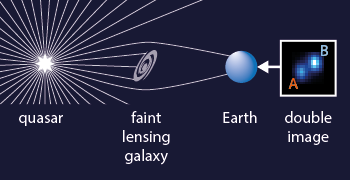 While the strong microlensing activity precludes a more accurate estimation of the delay between A and B, the rapid events are very rare phenomena, and thus unique tools for astrophysical studies. Optical spectra taken with the Gran Telescopio Canarias (GTC) confirm that the system SDSS J1339+1310 is an unusual “microlensing factory”, since appreciable microlensing-induced spectral distortions are also detected. The paper was accepted in September 2016 for publication in the journal Astronomy & Astrophysics, and is expected to be published soon.